Louis Vuitton Malletier à Paris, more commonly known simply as Louis Vuitton, is a luxury French fashion and leather goods brand and company headquartered in Paris, France. Fashion trends have a way of ‘returning’ after decades in hiding. For instance, the current love for leggings, so popular in the 1980s. The same can be said of fashion houses. Especially when it has a history as rich as Louis Vuitton’s. Creative director Marc Jacobs and his team delved into the house’s archives to find something classic that could be “reborn” in modern times. They found the Lockit. It was created in 1958 as a tote handbag with classic lines. 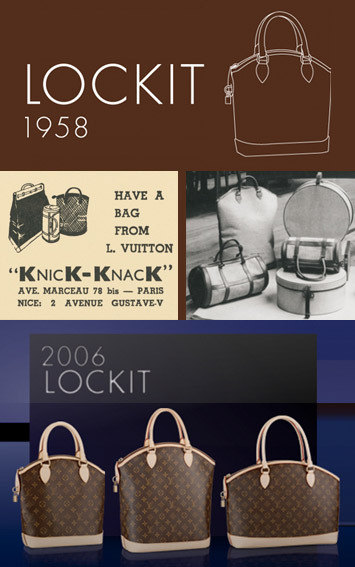 Recently discovered in the Louis Vuitton achieves, it was reissued to become the new Louis Vuitton icon for autumn 2006. It represents one of Louis Vuitton’s cherished themes – the marriage of straight lines and curves and the simplicity of chic elegance. It made its big-screen appearance in 1967 in the Stanley Donen movie Two For the Road with Audrey Hepburn. Originally a weekend bag in cotton canvas, the 2006 version is practical, especially for busy working women who will find lots of room to stash their files and secrets. A leather patch on the side enables one to “lock” the bag. Hence the name “Lockit”. This bag comes in Nomade natural leather or the Monogram canvas. This entry was posted on Monday, January 8th, 2007 at 5:35 pm	and is filed under Interesting Stuff. You can leave a response, or trackback from your own site.